All good things must come to an end right? Hollywood doesn’t seem to want to embrace this phrase though. Companies nowadays are in love with franchises. They are even more in love with remaking classic films to try and recapture that magic. Harry Potter, Hunger Games, The Divergent Series, The MCU, the list goes on and on. Even the new Power Rangers movie in 2017 is being geared up to be a franchise. The movie hasn’t even come out yet. Fans have been dying for creativity and innovation when it comes to movies that have heroes or people we know. I respect Nolan for putting an end to his Dark Knight Trilogy. He’s made it clear that he only makes movies when he has a story to tell. The Dark Knight Rises provides a clear sense of finality for fans. It’s a great ending to a great trilogy. One major difference with Nolan’s trilogy and these other movie franchises, is the spacing between the films. With these franchises, we’re getting films every year. The MCU has been doing a couple a year recently. The DCEU will join everybody in that trend in 2017 when Wonder Woman and Justice League come out. To me, anticipation makes a movie great as much as anything. Sometimes, fans can become a bit fatigued when it comes to these franchises. There were 3 years separating Batman Begins and Dark Knight. There were 4 long years between Dark Knight and The Dark Knight Rises. I couldn’t imagine Marvel or DC waiting 4 years between movies now. It’s effective because Nolan understood that Batman is Batman. People are going to go see the movie no matter what. I also have to compliment Nolan and his crew on their ability to adapt. He seems like a well-organized man. Most organized men plan ahead. I talked about it in my Dark Knight review, but Joker’s exit in the movie was less than spectacular. I’m guessing that Nolan had big plans for the clown prince in the third movie. Heath Ledger’s passing no doubt forced the crew, and Nolan, to refocus their efforts for the third movie. I have two “complaints” in this movie. My first comes right off the bat. The movie starts off with an incredible scene where we are introduced to Bane. It’s almost as good as The Dark Knight’s bank scene, but it surely is epic. Then, we learn a bit about what’s happened in Gotham since the last movie. We learn that it’s been 8, yes 8 long years since the last scene of TDK. Dent has been immortalized as a hero, and the world still believes Batman is the one who killed him. We see two police officers talking about Gordon. They talk about how they want him gone as commissioner and how his wife left him. We then get an introduction to Selina Kyle. She robs Bruce Wayne and we finally see the man himself. He has become a recluse. He has the beard, the cane, everything. This to me is a bit much. Actually, no, it’s way too much. I’ve read enough Batman comics and seen enough shows, to know that Gotham can’t survive 8 minutes without Batman, yet alone 8 years. He knows this too. Whenever something has happened to him, mentally, physically, or emotionally, he always wants to do everything he can to get back to protecting the city. I do understand it though. In the first two movies, Nolan gives us a broken, beaten Gotham and a strong, resilient Batman. Now, the tone of this movie has shifted to a broken, beaten Batman and a strong, resilient Gotham. It’s understandable, but it could have been portrayed in a different way. I loved Bane in this movie. His voice was a little bit weird to me, but I got used to it pretty fast. His scenes in this movie are all great and I love how he drives the plot, just like Joker did. The plot moves on nicely throughout this film. We see Bane’s numerous connections throughout the city. Gordon is kidnapped by Bane’s men investigating something, but he escapes. Blake is another character who pops up here. He is promoted to detective by Gordon to investigate Bane. The dynamic between Bruce and Alfred is expanded here too. When Bruce realizes he needs to get back into the Batsuit, Alfred pleads him not too. Bruce’s motivations are clouded. He brings up how Rachel was willing to wait for him. Alfred then tells him about the letter he burned in TDK where Rachel says she wanted to marry Harvey. The scene is rough because we see the breakup of one of the greatest tag teams in comic history. What really sticks out to me in this movie, is the differences, but still small similarities, with TDK. I said in my past reviews, the each of these movies revolve around a central word. Batman Begins is fear. The Dark Knight is chaos. I believe The Dark Knight Rises’ word is order. Bane believes Gotham’s order is a façade. Joker believed the same thing. Joker didn’t care about anything though except exposing people’s true nature. Bane wants to disrupt the establishment by completely taking over. Both are fed up with the system, but have two opposite approaches. Later in the movie, we are introduced to Miranda Tate. She’s one the Board of Bruce’s company. Bruce wants to give her the company, so the corrupt men don’t take it. We see a fun scene where Bane breaks into the stock exchange. His actions bankrupt Bruce, and we see Bruce don the Batsuit again. The whole scene was pretty great. Bruce and Miranda then have a romantic moment at his mansion. His power has been cut off and all of his money is basically gone. Bruce needs comfort in his time of need, and coincidentally, Miranda Tate is there for him. It was well timed by her. The sewer scene is one of my favorite scenes ever in a movie. Catwoman says she’ll help Batman find Bane, but instead she lures Batman into a trap. It is revealed that Bane knows who Batman really is. The lighting of this scene makes both characters look awesome. What I also think is great in this scene, is the silence. There is no music playing. We get to experience every punch, every grunt, and every kick because there isn’t any music. The fight doesn’t look amazing like something from Captain America: Winter Soldier, but the lack of CGI in this scene does make it feel real. Batman is fighting an opponent who is physically stronger than him. Doesn’t happen too often and it hasn’t happened in Nolan’s trilogy before this. The intensity of the fight is off the charts. I was in the theater jumping out of my seat yelling, “Get him Batman. F— him up!” It was awesome. The quote where Bane talks about “the darkness” is creepy, but well done. Soon, we realize that Batman won’t win this fight. Nolan then pays homage to the Knightfall comic by making Bane break the Bat. He picks up Batman, lifts him in the air, and drops him directly on his knee. The crunch of Batman’s back made me cringe in the theater. The next part of the movie is where Bane is in total control. I love Nolan amplifying the stakes here by having Bane take over the city. Joker took over the city, but with chaos. Bane is establishing a new order. He traps the entire police force in the sewers, kills the Mayor in an explosion, and gives the people of Gotham an option. Parish under your old system, or thrive in this new, “free” world. He destroys a football field (one of the coolest scenes ever) and brings out a neutron bomb. He kills the doctor from the beginning of the movie, when the doctor says he is the only one who can disarm the bomb. Bane then tells the people of Gotham the truth about Harvey Dent. He got Gordon’s speech from him when Gordon was in the sewer. This only gives Bane’s motivations and reasons more clarity. I applaud Nolan for putting this scene here. He reads the letter, where Gordon says Harvey was a killer. That Harvey wanted to kill his son. Bane uses this to add more fuel to the fire. He’s showing Gotham that this is who you put your trust in. This is who you believe is telling you the truth. Order is a façade. 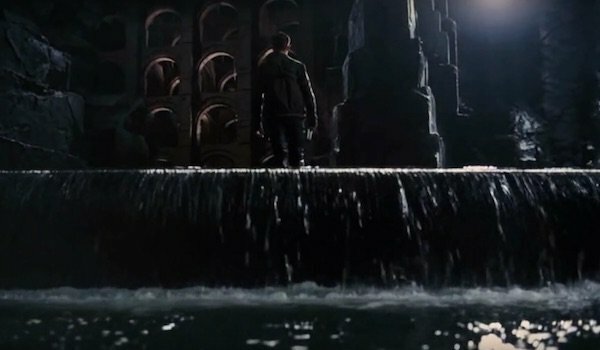 Bane creates his own courts, frees prisoners from Blackgate, and takes absolute control of the city. You Better Kill Him The First Time! The title of this section tells you all you need to know. Is there any hero who can recover from a defeat better than Batman? I don’t think there is. Bane breaks the Bat in this movie. We see him down and out. He’s taken to a foreign prison where a doctor helps him fix his broken back. Bruce trains himself to be better next time when he fights Bane. First though, he must figure out how to get out of the prison. This is where we see Ra’s again. You find out about his immortality and how he lost a child down in the prison. Bruce concludes that Bane is Ra’s heir, his son. Bane also forces Bruce to watch every single event happening in Gotham. The cops being trapped, the stadium explosion, the Blackgate speech, everything. I chuckled watching this because I knew Bane would regret it in the end. Such a bad mistake to fuel a man who already has an incredible will. Finally, Bruce escapes the prison and his ready to take on Bane again. We see a cool scene where Batman coaches Blake on how to throw one of his grenades. This moment was cool because some of us truly enjoy watching Batman and Robin. We enjoy the father/son moments between the two. We also enjoy the teamwork. Nolan putting this little scene in here reminds us die-hards of the fantastic duo of Batman and the boy wonder. As I mentioned earlier, Bane and Joker broke the city in different ways. By the end of Joker’s run on TDK, people were tired. They were scared. Joker brought the city to its knees by showing everyone just how corrupt Gotham is, even its saints. By the time people (especially those cops) are ending their Bane run, they are angry. Angry and sadness brings out two different emotions sometimes. The people of Gotham beat the Joker with the two boats. Not because they wanted to, but because neither thought murdering a bunch of people was right just to save their own skin. Joker was certain they would fail, but they didn’t. No one even realized they had “beaten” the Joker. Only the Joker himself and Batman realized it. TDKR however brings out a different side of Gotham. These policemen have been away from their families for months. Bane wants to prove to Gotham that they need a new system. The citizens don’t agree with that at all. Joker manipulated a system everyone thought was good. Bane tried to rid the system because he thought his way was good. All of this built up to the insane fight between Bane’s army and the cops of Gotham. It was a great scene and the emotion behind it was significant because of that anger in the people. I love how Nolan always eventually gives the people of Gotham the victory. The last part of the movie is pretty good. The last fight with Bane and Batman is awesome. For the first time in Nolan’s trilogy, Batman threw a kick to send Bane through the glass. And it was marvelous to watch Batman beat the mess out of Bane. Bane was still trying to figure out how a “broken” man could survive in that prison. Batman tells him that he knows he escaped. Confusion enters Bane’s eyes as he tells Batman he never escaped. Miranda Tate then stabs Batman in the side, revealing she is Talia al Ghul, daughter of Ra’s. The reveal is cool from a movie/story standpoint but what happens next makes it my biggest complaint with the movie. It is revealed that Talia set everything up. Played Bruce’s emotions and left him vulnerable. She says Bane is her protector. That word right there made me mad. It reduces Bane from the badass he’s been throughout the entire movie, to a side piece. Talia then leaves and Bane is left to deal with Batman. As I’m watching, I’m thinking, “Cool! Batman v. Bane round 3!” except we all know that didn’t happen. Catwoman rides in on Bat’s motorcycle, shoots Bane and kills him. I yelped with anger in the theater when I saw this. It is one of the most terrible ways a cool villain has ever exited a movie. I thought Nolan would want to satisfy the audience after Joker’s exit, but clearly the big reveal was more important. Nevertheless, the plot moves forward quickly after Bane’s death. Talia is soon killed and we learned she’s set off the neutron bomb to detonate. Batman has no choice but to take the Batwing and fly the bomb over the river, so no one can get hurt. Batman and Catwoman share a passionate kiss, then he gets into the Batwing. Gordon asks him who he is. Batman responds with a scene from Batman Begins. He talks about when his parents got killed and how Gordon gave his jacket, and let Bruce know everything would be okay. Gordon realizes who Batman is, but the scene is perfect. Everything comes full circle. Batman flies the bomb out to the river and it explodes. He is presumed dead. The movie wraps up well. Bruce Wayne is said to have died during the riots, and Alfred really does believe he’s dead. Then Lucius learns that the autopilot has been fixed on the Batwing six months ago. Gordon finds the Bat symbol refurbished, and Alfred sees Bruce in Florence with Selina, alive and well. The movie ends with Blake finding the Batcave and the floor rising up under his feet. This movie is just as good as the other two to me. They all feel like one enormous story. Like a Lord of The Rings or Star Wars. The action in this movie was better than the first two. Nolan stayed true to his practical effects so everything in the movie looked outstanding. 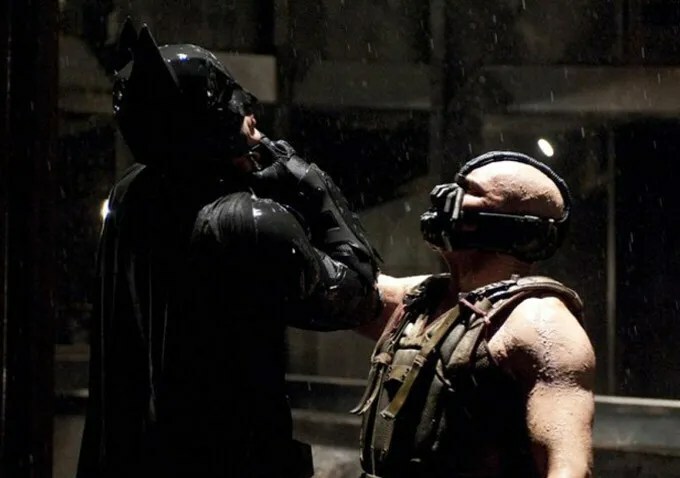 My two complaints about the movie don’t take away from the Dark Knight trilogy, but I do believe Bane’s legacy in this movie is hurt a bit with the poor exit. Like I said before, I loved how Nolan makes everything comes full circle. He leaves a lot open to interpretation. Would I love to see another Nolan Batman film with Blake at the helm fighting a Riddler played by Leonardo DiCaprio and Bryan Cranston playing Black Mask? Yeah I’d buy tickets now even if the movie came out in 2025. But that wasn’t the point of Nolan’s movies. He wanted to tell the story of Batman. A story of personal struggle, and inner turmoil. A story about a city suffering from corrupt, evil men. A story about the connection between that broken man, and that broken city and how they make each other better. I’m sad we won’t see anything else like it, but I’m extremely happy we have this trilogy to enjoy for years to come. This is exactly why progression is such an important word to me regarding films. In TDKR we see a broken, beaten Batman and a hero’s death at the end. Batman v. Superman tried to give us both in one movie but without the progression. Nolan’s trilogy made the rough Batman in the third movie make more sense. I wouldn’t have blamed him if he would have snapped Bane’s neck. When he “dies” at the end, it hurts. It hurts because we’ve grown with this character. We know this is the end, so it feels real. Giving me a murderous Batman and the death of Superman in the first movie (or second whatever) in the DCEU is weird. I didn’t care at all for Superman’s death because I know they have 15 more movies planned. Nolan understood the progression and pacing he needed for this movie to work. That factor is only one of the things that make The Dark Knight Rises is an exceptional ending to one of the greatest superhero trilogies of all time. I hope you enjoyed the review. Please tell me your thoughts on it. All feedback is welcome! As always, follow me on Twitter for more updates and news tweets. @Hero_Review Until next time!